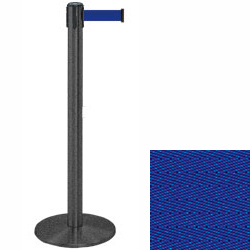 These black stanchions with blue belt have a sturdy design that makes them an excellent choice for high traffic areas. This type of crowd control post is made of durable metal with a neutral wrinkle finish. The black stanchions with belt additionally come with a round weighted base that keeps them upright retail stores, event venues and service organizations. 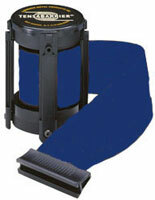 Included with each crowd control pole is a 13" long strap that has a nylon fabrication for extra strength. The black stanchions have a 4-way adapter on top that can receive straps from up to three other Tensabarrier stands.